We had a great day at Clover market yesterday, thanks for everyone who stopped by my space and said hello. It’s so great to finally meet people I only know through the computer. Today I am holding a GIVEAWAY on The Painted Home’s facebook page. To win a ticket you have to LIKE The Painted Home on facebook and leave a comment on the giveaway post on FACEBOOK – not here on the blog! For a second chance to win, visit Philadelphia Salvage on facebook and look for their giveaway post. 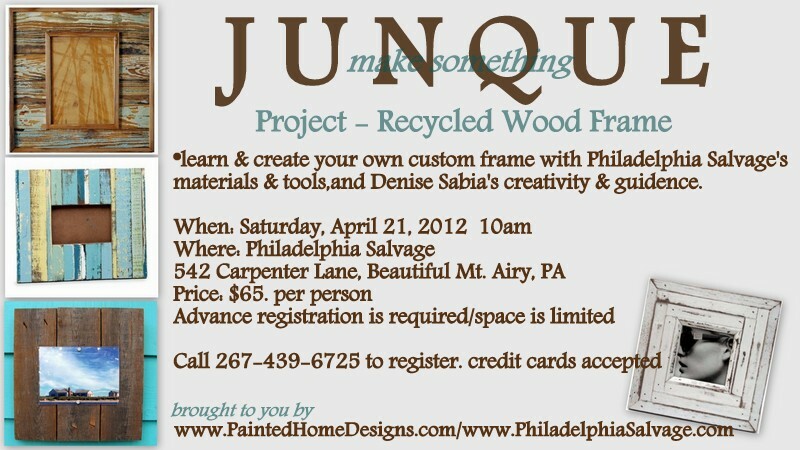 The ticket is ONLY good for the April 21st workshop. Good Luck and see you at the workshop! Denise it was SO great to meet you on Sunday! Have you recovered yet? I tried to take the day off yesterday, but a messy house got the best of me. I would love to go to the workshop with you, but we are going to be in Lancaster for the weekend. Have fun and can't wait to hear all about it!